White House Faith Briefing Features Christian Musicians Worshiping Jesus With "What A Beautiful Name"
A powerful session of spontaneous praise broke out during another White House Faith Briefing yesterday. In one video shared by Christian singer Tauren Wells, a group of worship leaders were shown praising Jesus and singing Hillsong Worship's “What a Beautiful Name”. These briefings are meant to update leaders on faith-based initiatives introduced by the Trump administration, but on nearly every occasion they become a time of praise. 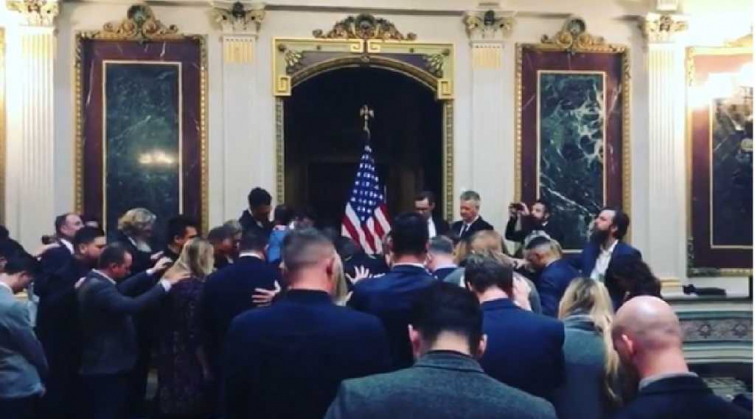 Dominic Shahbon, Bethel Music’s director of events, shared another video of the event on Instagram: "Had the honor to go the White House for a #FaithBriefing with key administration officials and faith leaders. Specifically, to hear about faith initiatives that are happening. Great things are taking place whether the media tells us or not! Let’s just say that I’m leaving Washington, D.C. stirred, hopeful, convicted and informed with TRUTH." This gathering appeared to be organized by Paula White, the chair of President Trump’s faith advisory board.